North Korea Tech lost its appeal to the Korea Communications Standards Commission over the recent blocking of this website in South Korea. At a meeting on Tuesday, the organization deliberated the block and confirmed it. The meeting did uncover a little more about the reason for the block, which was apparently requested by the National Intelligence Service. The site was accused of being a threat to South Korean national security because in part it introduces North Korean websites and includes links to them. The sites themselves, which are well known, are also blocked so attempts to access them in South Korea would result in failure anyway. The inclusion of broadcast schedules for Voice of Korea, North Korea’s creaky international shortwave radio service, were also frowned upon as was an article that analyzed a recent Korean Central TV documentary on the launch of the Kwangmyongsong-4 satellite. But there’s more! One of the five people deliberating on the appeal — three appointed by the ruling party, two by the opposition — suggested North Korea Tech might be a sophisticated propaganda effort that originated in Pyongyang. “We should ponder why a UK citizen has a deep interest in North Korea,” said Cho Young-ki, according to an NK News report. Cho is one of the three appointed by the ruling party and is also a member of the Department of North Korean Studies at Korea University. North Korea Tech is working with the Korea Internet Transparency Report and OpenNet and will continue to fight the block. In the meantime, anyone in South Korea can get around this and other government censorship by using a VPN. 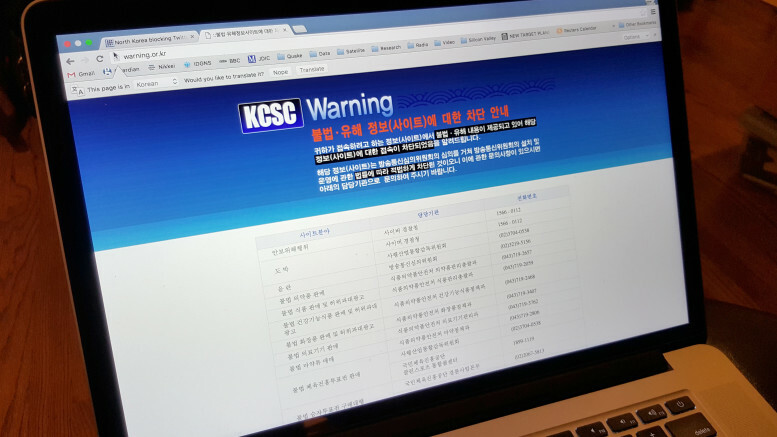 Under South Korea’s Internet censorship system, different government agencies request the KCSC implement blocks on websites.In 2015, the Korea Communications Standards Commission received takedown requests covering 135,000 web sites. 1 Comment on "South Korea confirms censorship of North Korea Tech"
I am a US citizen with a deep interest in NK and am offended that the mere foreign nature of my being is cause enough to suspect me or the motive’s of those like me. SK is doing themselves a great disservice acting this way but it’s not as if this all that new.